Application: For material handling, crane lifting, and rigging - *NOTE: Cannot be used in choker hitches. It can be used in vertical and basket hitch lift arrangements only. 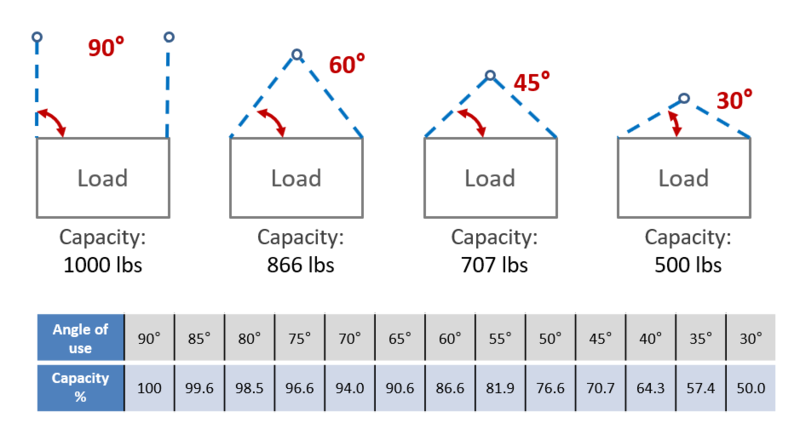 WARNING: Working load limits vary depending on the angle of use - Capacity is reduced as the angle of use declines - Capacity of the nylon sling is always highest at a 90° (degree) angle (vertical hitch) of use and smallest at an angle of 30° (degrees), or less - Please refer to the education section (see 'Educational' tab below) for more information - Never exceed rated capacity! A low quality webbing sling can cause injury and damage. A look-alike nylon sling often found at lower prices is also often advertised to conform to the same safety standards (if at all). Be aware that it may refer to safety ratings in effect decades ago. So for example under the same safety standard a decade ago, a nylon web sling may be rated to 100% without proof load testing while today it may be 300% with proof load testing. Be assured that we only sell the highest quality nylon slings and our advertised safety standards conform to the current ASME standards. 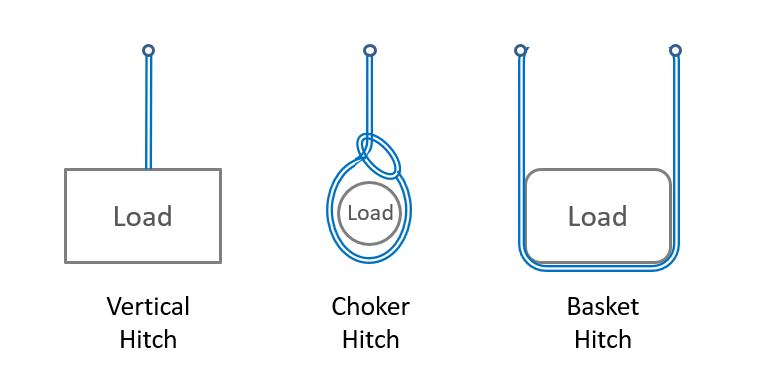 Working load limits (capacity) of nylon slings vary depending on the angle of use. The capacity is reduced as the angle of use declines. 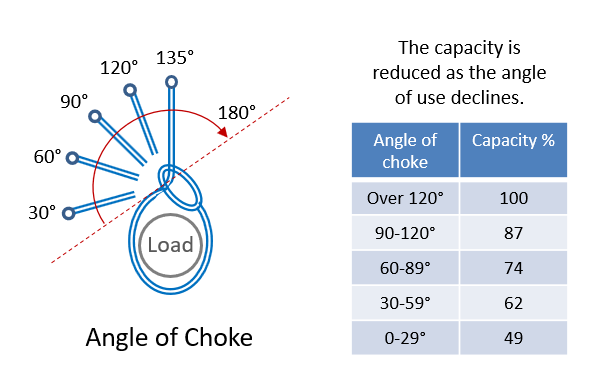 See drawing below how a 1,000 lbs capacity is reduced as the angle of use declines. The nylon web sling's capacity is always highest at a 90 degree angle of use and smallest at an angle of 30 degrees (or less). In the field, a nylon web sling is often commonly referred to as a "choker". The nylon has the advantage of being lightweight. It is very flexible and relatively soft; therefore, it is suitable in applications were minimal damage to the load's surface finish is important. When the flat style webbing sling is employed it can be wrapped around a load, evenly distributing the lifting force over a relatively wide area, thereby reducing the contact pressure. Flat and round varieties are available and they are manufactured in numerous widths and lengths and are available in 1, 2, 3, and 4 ply thickness to accommodate a range of loads. Class 7 (heavy duty service) nylon webbing is most commonly used in fabrication. Other classes (6 through 9) are also sometimes used in fabrication. Without adequate protection, nylon slings are susceptible to abrasion or being severed when impinged on even a moderately sharp edge. Wear pads and sleeves (added thickness material) are available to provide abrasion protection at vulnerable points along the nylon sling. Exposures to certain chemicals and high temperature are important considerations when choosing a nylon sling. Nylon is resistant to most regularly encountered chemicals with the exception of moderate strength acids and bleaches. Elevated temperatures (above 200 degrees F) significantly reduce the rated load capacity of the web sling. While not as much of a problem, prolonged exposure to sunlight results in UV degradation of the nylon webbing sling. Nylon web slings can be fabricated to be endless (also known as a grommet sling) or with an eye at each end. Nylons eyes can be plain or fitted with various metal end fittings to allow vertical, choker, or basket hitch lift arrangements. Sling material is of three basic types: chain, wire rope, and nylon, each of which has its advantages and limitations. The chain sling has the advantage of being durable, very flexible and its length can be made adjustable. It will tolerate a wide range of temperatures; however, compared to other types, it is relatively expensive and, depending upon the grade of chain used, relatively heavy. The wire rope sling is not quite as durable. It is not as flexible as chain but its greater stiffness can be an advantage if it has to be inserted through a small opening or beneath a load. However, when wrapped around a load, it often tends to deform permanently to the shape of the load. Wire rope suitable for slings comes in a variety of grades and constructions. In most cases looping back and securing the loop with a metal sleeve terminates the rope. This forms a loop or soft eye, the simplest form of sling end. Thimbles are used to support and protect the eye from abrasion. Wire rope is generally cheaper and lighter than chain which can be a plus, particularly for applications that require long lengths. The nylon sling has the advantage of lightweight in comparison to chain and wire rope. Nylon is very flexible and relatively soft; therefore, they are suitable in applications were minimal damage to the load's surface finish is important. The webbing sling is made endless or terminated with an eye by means of a handmade splice. Similar to a wire rope sling, various terminal fittings are available. Without adequate protection, a nylon sling is susceptible to being severed when impinging on even a relatively moderate sharp edge. Type 1 Nylon Sling: A webbing sling with Type 1 fittings consists of a small metal triangle eye fitting on one end and a larger slotted triangle metal choker style fitting on the other end. This arrangement is commonly referred to as a triangle & choker or "TC" nylon sling. This arrangement provides the most effective choker hitch. It can also be used in vertical and basket hitch lift arrangements. Type 2 Nylon Sling: A webbing sling with Type 2 fittings is similar to the Type 1 except both ends are equipped with the smaller triangle style metal end fitting. For a given size and length, it is more economical than the Type 1. This nylon rope is not recommended for choker hitches but is suitable for both vertical and basket hitch lift arrangements. This nylon sling is often referred to as triangle & triangle or "TT" sling. Type 3 Nylon Sling: Flat loop eyes formed of nylon and oriented in the same plane as the sling body comprise the Type 3 sling. It is often referred to as a flat eye & eye (FEE) or double eye nylon sling. This nylon sling type is extremely versatile being used in all types of hitches. The flat cross section makes it easily removed from beneath the load once it has been placed. Type 4 Nylon Sling: The Type 4 webbing sling is identical to the Type 3 excepted the flat nylon loop eyes are rotated 90 degree to the plane of the main nylon sling body. Sometimes referred to as twisted eye & eye nylon sling it carries the same "FEE" designation. The rotated plane of the eyes promotes an improved choker hitch. When using the basket hitch arrangement, the two rotated eyes join compactly. Type 5 Nylon Sling: This webbing sling has no end fittings. It is a simply constructed sling consisting of an endless loop of nylon webbing overlapped and sewn together. This nylon sling is economical and adaptable with uses in all hitch arrangements. Its continuous configuration offers no fixed wear points. This nylon sling is often referred to as a grommet and it has been given the designation "EN". Type 6 Nylon Sling: This is the type of eye to sling body configuration that is desired where continuously and extremely strong and durable applications are required. The eyes are reversed and are formed using multiple widths of webbing attached edge to edge. The entire web sling, both body and eyes, have wear pads attached on top and bottom surfaces. In addition to abrasive protection, the extra webbing provides additional reinforcement resulting in exception strength. This nylon sling is also called a reversed eye or return eye nylons with the designation "RE". A nylon sling is also called a web sling or webbing sling.